I found this picture while searching the internet and it fits my blog so perfectly that I had not choice but to post it. I having been thinking all day about what I should write about. What was that one moment that stood out to me and made me smile today? I had a couple of things in mind, but nothing that overwhelmed me and then this picture popped up as I was killing time on the computer and it did more than make me smile...I got excited. If you have read my first blog entry then ﻿you already know that I believe you choose your attitude. 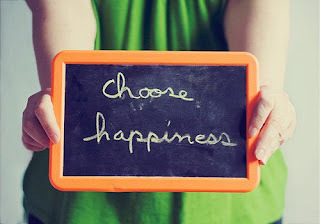 You choose to be in a bad mood or you choose to be happy. There are a lot of things that happen throughout my day that I would like to blame my mood on, but I know that I have the choice to override those things and choose to happy. If I had still been in my bad funky mood I probably would not have taken the time to notice the amazing sunrise I could see from my back porch. If I had been grouchy I would have spent more time focusing on the negative things I heard people say instead of celebrating the nice email in my inbox. If I had still been so focused on how bad my life was I wouldn't have taken the time to find out that a friend was also having an amazing day and listen to her stories (which always make me laugh). If I had let my bad mood continue and ruin another day I would have been grouchy with my husband instead of taking the time to sit next to him and hold his hand, which in turned created a good day for him. That day I chose to be happy, and because of that I was able to see how wonderful my life really is.